Summer is here. The heat in Sydney on Sunday assured me of that. Luckily I have generous housemates: frozen yoghurt saved the day! Summer, for me, means a summer reading list (or pile). I spend my holidays catching up on all the reading I wish I’d done during the year. Seriously, why I can’t keep up with my book-buying I do not know. 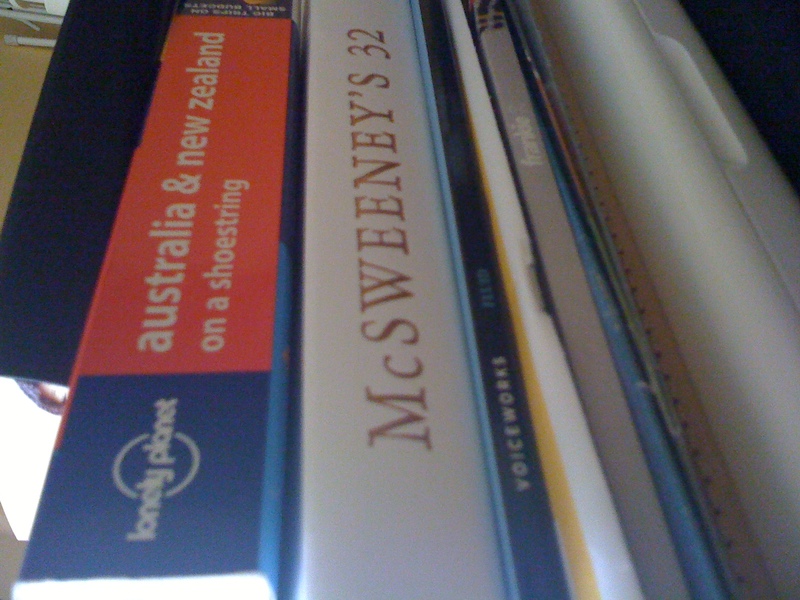 I’m going to New Zealand this Saturday, so I’m collecting a mental pile of books to take with me. I have about seven million books on my shelves that I’m yet to read, so I’m having a little trouble narrowing it down. Any suggestions? The picture above is my magazine and journal reading pile. Magazines and (some) journals are a great light-weight alternative to books when you’re travelling. So I plan to take this much-culled pile with me. Actually, I’m not sure I’m going to fit many clothes in. This entry was posted in Uncategorized and tagged New Zealand, Summer, summer reading by avocadoandlemon. Bookmark the permalink. guess what – Nam Le is launching our latest issue this Saturday. what a dude. Nice! Wish I could make it. This is one of those ‘why did I move away from Melbourne’ moments.